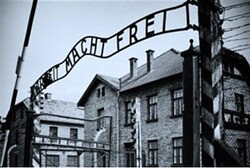 The Freeman Center - Maccabean Online - US Refrained from Bombing Auschwitz "To Avoid Jewish Influx"
US Refrained from Bombing Auschwitz "To Avoid Jewish Influx"
Historian David Wyman's research shows how repeated pleas to bomb camps were ignored intentionally. Mark Langfan, Chairman of Americans For a Safe Israel (AFSI), on Tuesday cited records to show that in essence "America and American Jews did nothing" to stop the genocide. Referencing Holocaust scholar David Wyman's research, Langfan determined that the US government "purposefully failed to bomb by a definitive government decision in February 1944." According to Wyman's research, Benjamin Akzin (1904-1985), a distinguished academic and recipient of the 1967 Israel Prize, was the first person to beseech the wartime American administration to bomb Auschwitz. Akzin that same month wrote a memorandum to his WRB colleagues arguing for the bombing,which he wrote would "slow down the systematic slaughter, at least temporarily,” since ”it would require some time” for the Nazis to rebuild the machine of genocide. American refusal: "They might send us the Jews"